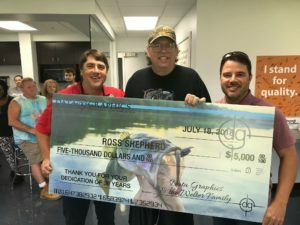 Latest Happenings/Blog | Data Graphics Inc. Latest Happenings/Blog | Data Graphics Inc.
What’s New With The Data Graphics Crew? January 2019 - We Did It Again & Celebrating 35 Years! 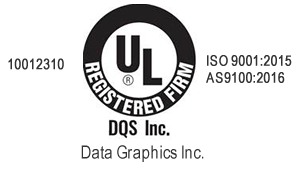 Data Graphics is proud to announce that we have passed our surveillance audit for AS9100:2016 Rev D and ISO 9001:2015! We couldn’t have done it without our entire DG Team. 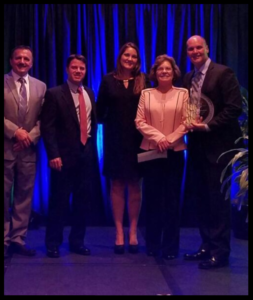 Special recognition to our Quality Assurance Manager, Shane Sherman and our Director of Manufacturing, Liz Minson. We are proud to have these certifications and provide our customers with a quality product and great customer service. Data Graphics is celebrating our 35th anniversary this year. 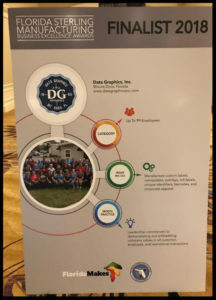 DG started in 1984 by Bob Welter, Jr., Data Graphics has grown from a small label and overlay printing company to now a full custom printing solutions manufacturer that employs over 70 people. From labels, overlays, nameplates, UID barcodes to corporate apparel, embroidery, promotional products, signs and banners. Data Graphics launched our DG Difference campaign over a year ago, this is our commitment to not only our customers, but to each other. Flexibility, efficiency, integrity and mutual respect – these are all part of the DG Difference. We want all of our employees and business to be conducted with these characteristics in mind. This builds trust amongst us all which enables the product to move through the plant quicker and get it to your dock. We want to help build your successful business. When you are successful, we are as well. We hope that some of this DG Difference translates to you and beyond. All of us here at DG are thankful for Bob’s dream, making it a reality, taking risks and are hopeful for the years in front of us. Data Graphics isn’t just adding new equipment, we are expanding our capabilities. Each opportunity that we receive from our customers are carefully studied for the best printing and cutting methods. With requirements changing all of the time, Data Graphics must continue to invest in our machinery, as well as providing training for our employees. Earlier this year, we updated our Metalphoto equipment. However, this recent investment of equipment is to increase our size capabilities. For too long, we have had to turn away opportunities that were dimensionally too large…no longer! 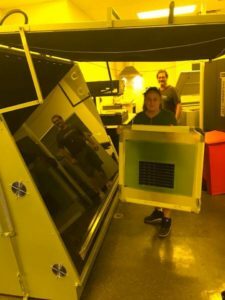 While we have a 4 ft x 8 ft wide format digital press, we have been limited on the materials that we can produce on this press. 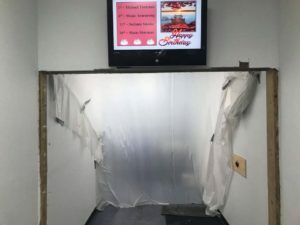 Now we will be able to print 40″ x 50″ and if we are going to print larger, we need to be able to cut larger….we will be maxed out there at 32″ x 47″. Our exposure unit was first installed, this is used to make the screens for our larger and existing printing presses. The new screen press was delivered last week and we are proud to report is already producing your printed products! The new die press will be another month, we have to make some room for it. None of this would be possible without the relationships that have been built and the opportunities presented. Thank you from all of us at DG! 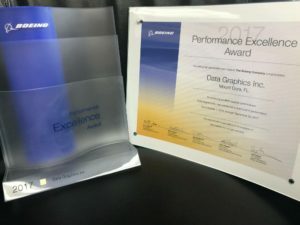 Data Graphics was among a highly select group of Florida manufacturing companies to be recognized for excellence as part of the Florida Sterling Manufacturing Business Excellence Awards Program. 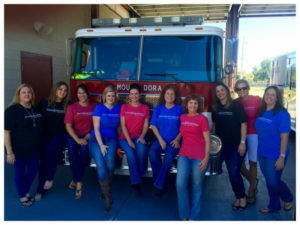 The Florida Sterling Council and Florida Makes collaborated on this statewide recognition. Companies were judged on leadership, strategic planning, customer and market focus, measurement analysis and knowledge management, workforce and operations. 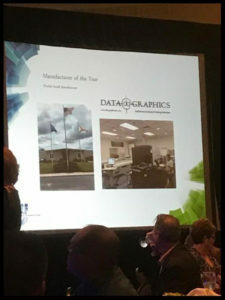 Data Graphics went through multiple phases of judging after being nominated earlier in the year for this prestigious award. A site visit evaluation took place in February and included a panel of judges and examiners taking a tour through our facility along with a questions and answers session at the end. 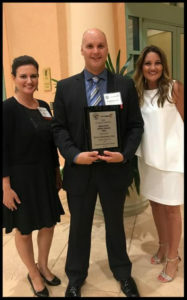 President Brad Butterstein, Vice President -Sales, Buffy Carroll and Sales Engineer Alissa Vance represented Data Graphics at the annual awards banquet at the JW Marriott in Orlando, FL on June 1st where they were announced as Runner Up for the Manufacturing Business Excellence Award. 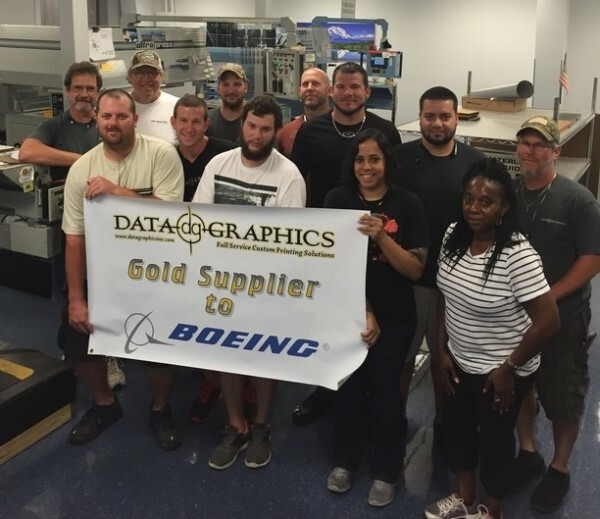 All of us at Data Graphics are very proud to be recognized among Florida’s top manufacturing firms. Data Graphics doesn’t just want to be your choice custom printed product solution, we want to partner with you. For over 30 years, Data Graphics and Rockwell Collins have done just that. Last month, Buffy Carroll, VP of Sales and Mike Welter, Owner visited the Rockwell Collins corporate headquarters and attended the RC Supplier Conference. This event includes suppliers from all over the world, RC leadership, promotes supplier engagement and celebrates exceptional supplier performance. We learned the direction RC is taking in the upcoming years and what we can do to support that effort. DG was also visited by the Quality Assurance Team from RC and we all took a pledge together, “I STAND FOR QUALITY”. We thank RC for many years of building relationships, creating and sharing opportunities with DG so we can continue to grow together. 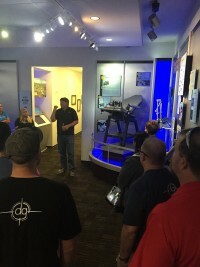 If your company would like to visit DG or have us attend a supplier event, let us know…click here! Future F-35 Pilot. The helmet looks to be a perfect fit. RC visits DG… “I STAND FOR QUALITY” pledge is well underway at DG. Mike trying out a little Virtual Reality Distance Learning. January 2018 - New MetalPhoto Printer! 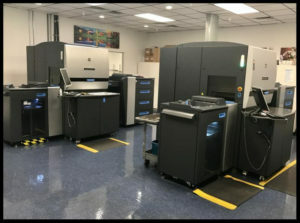 Data Graphics is moving on up….we recently took delivery of some new equipment that will enhance our metalphoto process. Our relationship with Horizons goes back over 30 years. 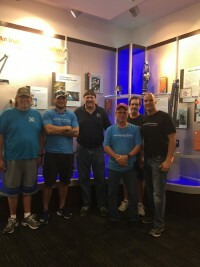 Their team came down from Cleveland and assisted in the setup and training of our new machines. The benefit of this new machine is that it reduces steps in several areas. The original machines required films…..to process an image on photosensitive aluminum, however this machine does not. If you think about barcodes and serial numbers, we have to have a film that includes serial numbers/UID barcodes…if your quantity was more than one sheet would yield, that’s right we have to print multiple films and expose each one to a sheet of aluminum. Another advantage to the new machine is the sheet gets fed through the machine (Liz, our Director of Mfg is displaying) and then goes straight into the processor and developer, fresh water is fed into the machine for a final rinse. 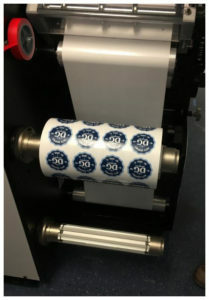 Metalphoto is an ideal material for labels and nameplates that need long-term durability, exposure to salt spray, providing corrosion, sunlight, abrasion, temperature and chemical resistance. 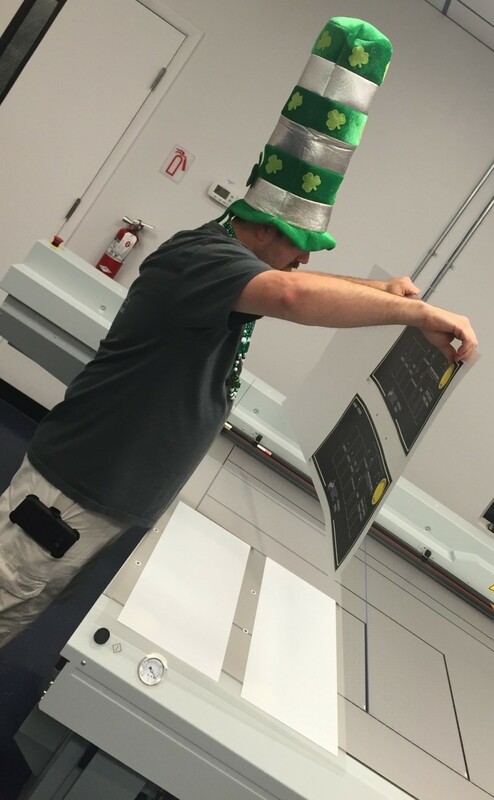 Data Graphics can offer this photosensitive aluminum in thicknesses ranging from .003″ – .125″ thick. 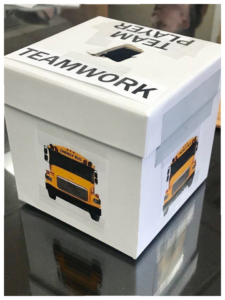 For the last 2 months our entire sales team and mgmt team participated in a team building exercise. We read aloud the book, The Energy Bus. The book is a journey that reveals 10 secrets on living a positive life, how to approach life and work situations and forward thinking. All of us were able to relate to situations in book as well as some of the characters, often calling each other out in our gatherings. A positive note we shared about our team members. 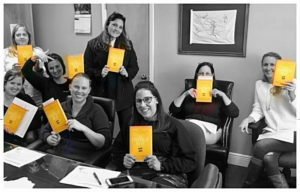 At the end of the book, our team met once more and created vision boards together….this team dynamic we have here at DG is not one you just see in photos, it’s a real appreciation and level of respect we have for one another. Investing in each other, our DG teammates is the DG Difference! 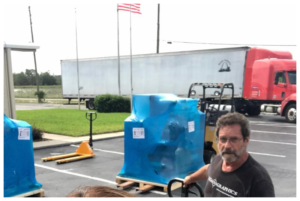 Irma blew through fast and furious, and left us with a mess to clean up, but thankfully all of our employees came out of the storm safe. As a Category 1 when it passed over, it was still a very scary storm as there were multiple tornadoes and very high winds starting from 7pm Sunday and through the night. Here at Data Graphics though we were lucky to have no damage, however we were without power for 3.5 days. 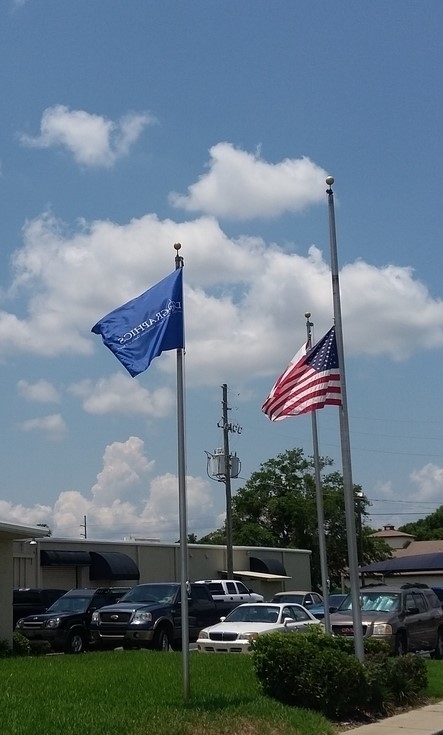 Our employees ranged from not losing power at all, to being without power for 10 days. Some had major roof damage, while others had limbs to clean out of their yards. We did recover quickly, as we tried to prepare for not being at work for a few days, and got as many orders out early that we could. 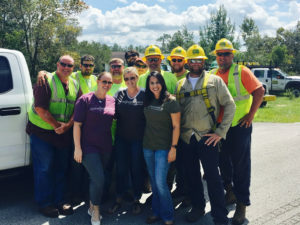 A handful of our DG Sales Team members made sure the lineman traveling from Tennessee to restore power to our county were fed. We were happy to be able to start October back on track. 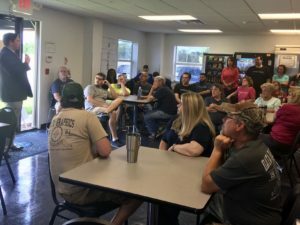 All of us at DG thank our customers that reached out and stood with us while we worked through catching up on what we missed while we were closed. 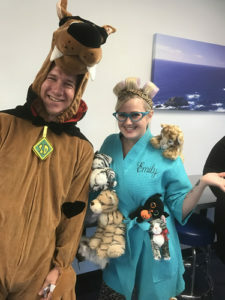 Data Graphics always host an annual Halloween Costume Contest along with treats for our DG Family. 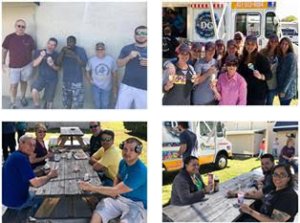 Our participation this year includes the sales team, who represented our Hot and Spicy expedite list…a few of the flavors were Mild, Hot, Verde, Spicy, Blazin, Fire and Diablo….we had 11 total. Our sales team strength is evident as they held up owner, Mike Welter who they forced into a Taco costume. Melissa Rye, one of our graphic artists and Indigo press operators was from the Day of the Dead. Stacy Kimball, while she was part of the sales hot and spicy team, she was the “Ghost Pepper Sauce”. Our promo production team represented the Pepto Bismol bottle and the side effects. 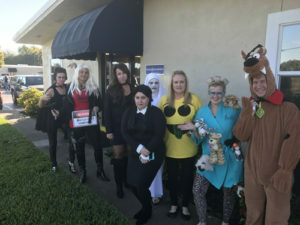 Halloween is always a fun time at DG….never long enough, as it’s the end of the month and we have your orders to ship! Have a safe and happy Halloween!! August 2017 - Happy Retirement Connie Aldridge! 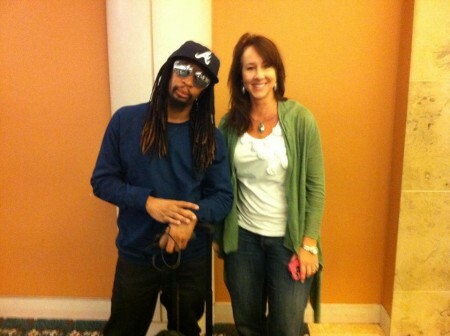 Connie Aldridge has been a part of the Data Graphics family since January 1987. Today, August 31st is her last day and she will be missed by many. In her 30+ year career at DG, she was a critical part of the sales team. Connie built many amazing relationships with our customers and has left a legacy, with big shoes to fill. Her and her husband Mick, spent many years for this day, she has recently completed building her dream home on a lake that they refer to as their Yalaha Paradise. They have lots of plans to travel across the US as well as to Ireland. Connie…thank you for the many years you gave to DG, we love you and will miss you! Click here to see a video in Connie’s honor, includes messages from her co-workers, customers and friends. 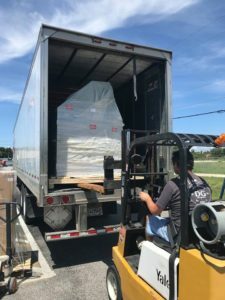 Data Graphics had a very special delivery early June, a long awaited new press that will continue to enhance our capabilities. 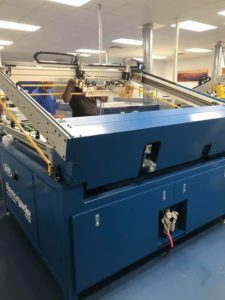 Our commitment to the customer includes continuous improvement and by adding this new roll label press to our expanding list of technology and equipment we are providing just that!! 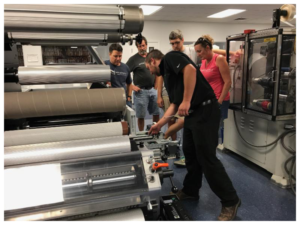 Our new press is a 4 color process digital roll press and will expand our roll label department where we also provide Flexography, Hot Stamp and Thermal Printing. This press will eliminate the “plate charge” you may have experienced in the past. Variable printing such as serialization and barcoding are also available. Our new press, that our sales team has named “Hemsworth” as they are already in love, can print on materials such as: polyester, polypropylene (BOPP), paper and vinyl. Extensive training has been provided to our roll department team members by the manufacturer as seen in the photos. All of us are very excited about the COLORFUL and unlimited opportunities in our future! 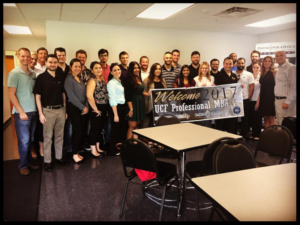 Data Graphics recently hosted UCF’s Professional MBA Program at our facility. Dr. Porter and Dr. Francisco, who we have worked with over the years include a visit to our facility as part of their coursework. The exposure of small business and manufacturing is invaluable for our up and coming business professionals. 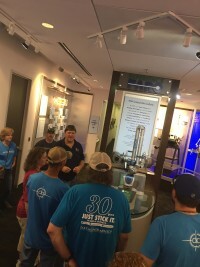 DG provided a full tour of our facility, explanation of ISO/AS9100 Quality System Procedures, interaction with our team members and a question and answer session throughout. Partnering with our community through our local schools and colleges is all part of the DG Difference. Director of Manufacturing. 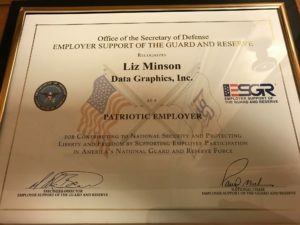 Liz was recognized by our very own Josh Gee, a DG Screen Printer and National Guard Member. He submitted Liz’s name for the award. Josh, we thank you for your continued service protecting our freedom and for being a DG employee. 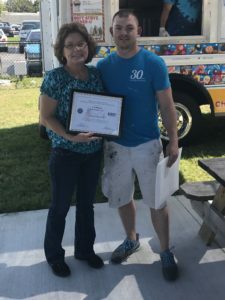 Liz, we appreciate your 28 years of service to DG and for supporting Josh in his Guard Service. The DG Difference at it again!! 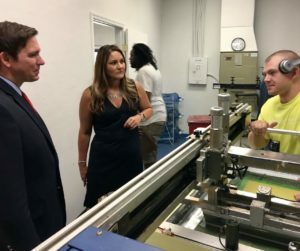 Data Graphics was very proud to have Congressman Ron DeSantis , United States Representative for Florida’s 6th District tour our facility this month. 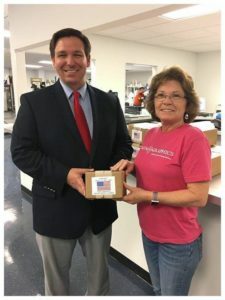 As a small business, we see costs rising and it was a great day to be able to get our points across to the Congressman. 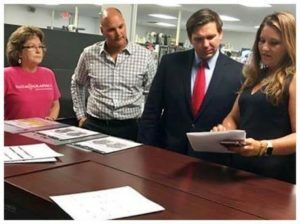 Congressman DeSantis met with several employees on his tour of our facility and held a town hall at the end of the day. March 2017 - Got Ice Cream? 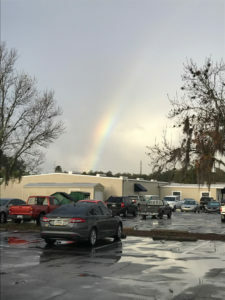 Data Graphics celebrates our team of ~70 on a random Florida, winter day that happens to be in the 80’s. Who doesn’t have happy ice cream truck memories, the sound of the truck coming down the road, playing the familiar tune and rushing out to make sure you meet it before it gets too far away. DG took the worry away when they brought in a local ice cream vendor for an all you can eat ice cream truck day. 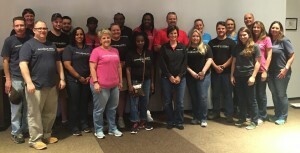 Guess what the results were… happy employees and teammates. Everyone as you can see had a great time and we will have to do this again. Data Graphics celebrates one of our team members, Josh Gee and his accomplishments outside of DG. 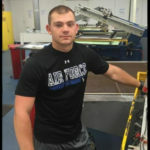 Josh is a screen press operator at DG, but he’s also a Staff Sergeant with the United States Air Force. Josh was sworn in as a Federal Officer this January and was part of the Inauguration of our 45th President, Donald Trump. His squad of 13 is seen in the below photo. 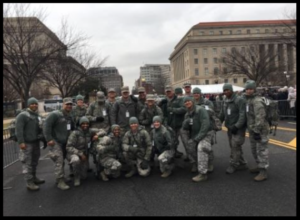 The National Guard was represented from 32 states. Thank you Josh, not only for being a dedicated DG team member, but for the service you provide to our country and the American people. Time is flying and so is our team. Data Graphics is committed to another amazing year, full of growth and positive changes. 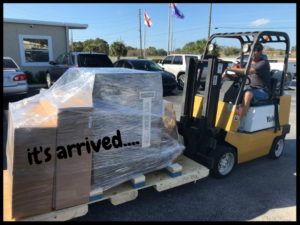 New equipment has already arrived, 3 new employees have been hired this year and our sales and admin team have already completed a certification in Excel. Investing in our people is what it’s all about, all of us are very excited about the direction and plan for 2017! 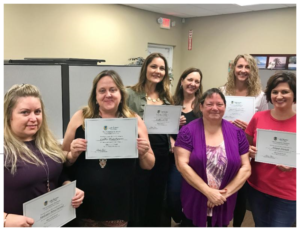 Melissa (HR/Admin/Acct), Cathy (Sales), Buffy (Sales), Stacy (Sales), Linda (Instructor), Shianne (Sales), Alissa (Sales) and Penny and Lisa (both Admin/Accounting) not pictured. Data Graphics is committed to growth and taking care of the customer. 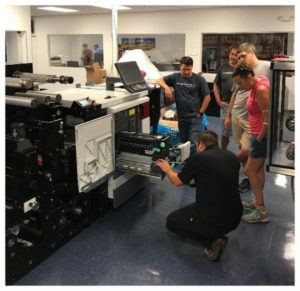 Last year, we experienced an overflow on our HP Indigo 5600 Digital Press, mixed with some hurricane material delays…calling the customer to let them know we will be late on an order is never one we want to make. So this February, we added another digital press. All of us at DG are ready…polycarbonate, polyester, vinyl, paper and a handful of other materials!! January 2017 - 30 Years of Dedication! As Data Graphics turns 33 this year, a select few of our DG Team members celebrate milestone anniversaries. 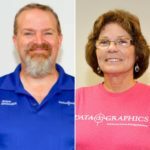 So far Data Graphics has had 4 employees hit the 30 year mark. Recently, our very own Connie Aldridge (Sales) celebrated her 30th as well as Miss Annie Mitchell (Assembly)…both seen in the photos below with owners, Mike and Bobby Welter.Connie celebrated 30 years this January and was presented in front of the entire company, with her husband Mick hidden in the audience. Annie celebrated 30 years this past November. She drives an hour to and from work every single day!! All of our DG Team members receive a nice gift at their 5th, 10th,15th, 20th and 25th anniversaries. However, what all of us are waiting for is the big 30….to be presented with the $5000 check as Connie, Annie, Tim and Karen have. The investment in our people separates us from other businesses….the DG Difference! Our team at DG is thankful for the recognition and other benefits provided to us by our amazing company! 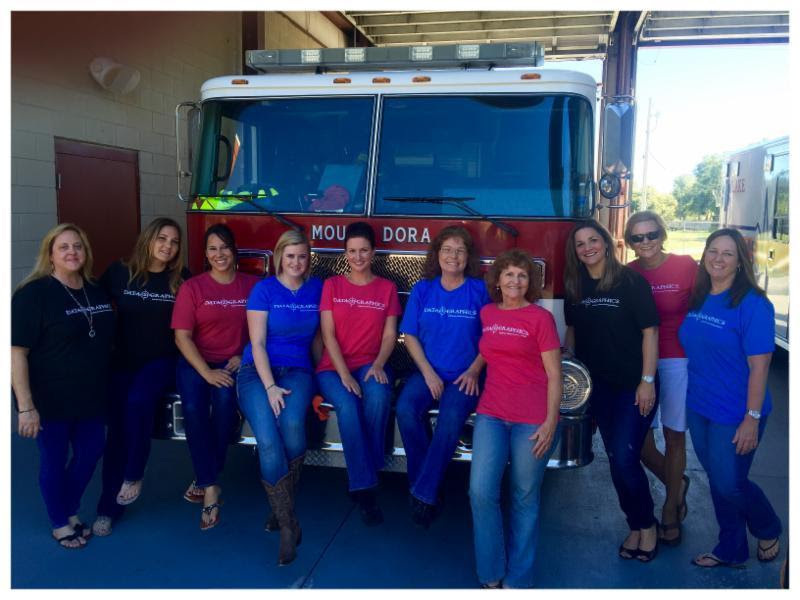 Data Graphics, Inc. is committed to supporting the community in which we live, work, and play. 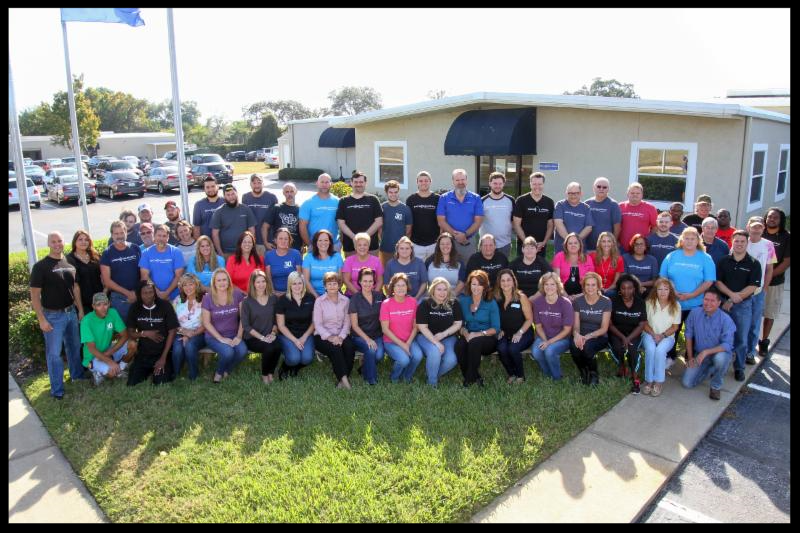 Our employees live in Lake County/Central Florida and are involved in various organizations which make a difference in the lives of many in our area. 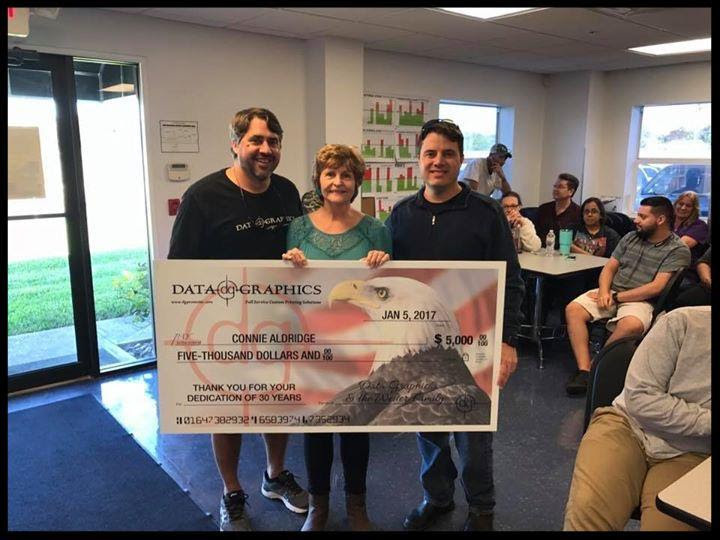 For over 30 years, Data Graphics has been dedicated to supporting charities that are impacting causes ranging from poverty and basic family needs to the arts. 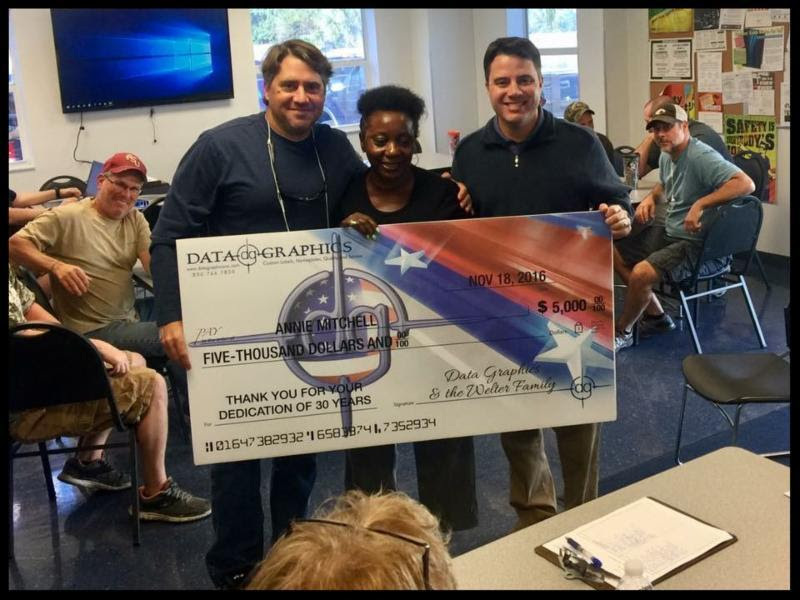 Data Graphics believes strongly that we can make a positive impact to these causes and try to make the lives of the folks that need a helping hand a little better. It is what life is about, helping each other. Click here to see a list of the great causes we have supported. WOW…..our year ended with a bang and a new beautiful plaque for our wall. 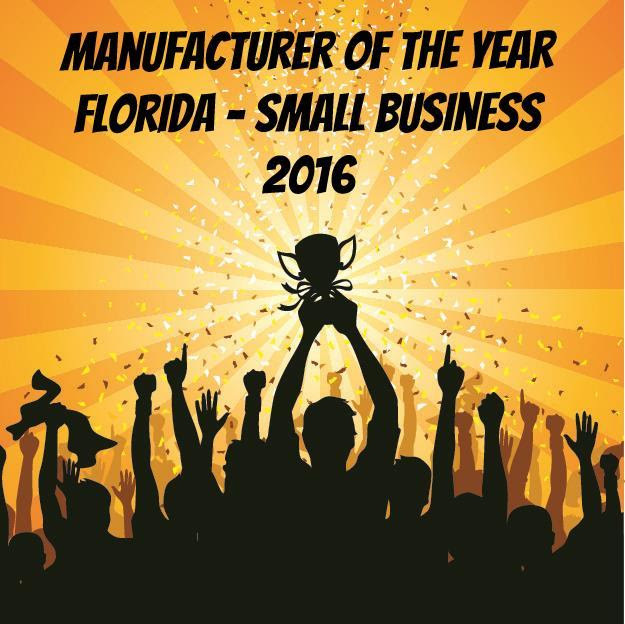 All of us are still so excited by the recognition we have received, being named Manufacturer of the Year-Florida Small Business. 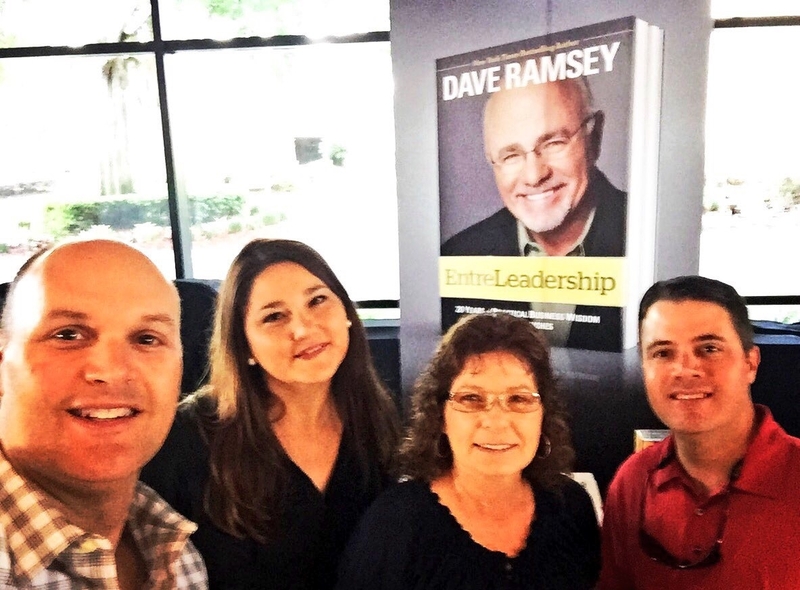 Our DG Team is so blessed to have an amazing source of customers, vendors and teammates. Thank you for an awesome 2016 and we look forward to seeing you all on the other side. Thank you to our customers, as we could not have done this without you! 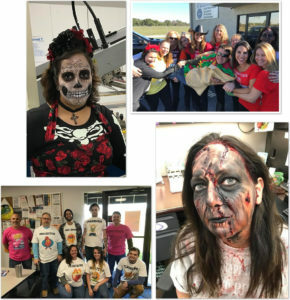 October 2016 - Happy Halloween from Data Graphics! All of us here at DG enjoy the festivities that go along with Halloween, especially the candy and the creativity! Our participants this year were very creative and enthusiastic! Emily (Crazy Cat Lady) took away the “Most Creative” award. Jason (Scooby) for “Funniest” Costume. 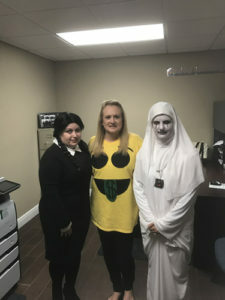 And Penny (Dead Nun) was definitely the “Scariest”. 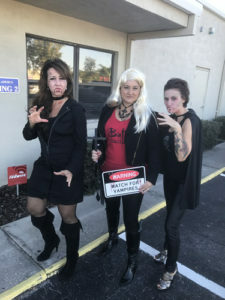 Also participating in our costume contest was Melissa (Wednesday), Lisa (Money Emoji) and your Vampire Team, Alissa (Vampire) , Buffy (The Vampire Slayer) and Jacquelyn (Vampire). Thanks to all that took the time to participate and make this Monday and last day of the month more enjoyable!! August 2016 - Hot Summer! A long, “hot” summer…. but WOW that has not slowed down our customers or DG. Us Floridians are used to this heat, but just in case, our local Fire Dept is located directly behind our building!! Our experience and knowledgeable team continue to get your “hot” orders out prior to our typical lead time of 10 working days. Have a printed need and need it quick, send it over and let us put that fire out for you!! DATA GRAPHICS WILL BE CLOSED IN OBSERVANCE OF LABOR DAY, MONDAY, SEPTEMBER 5TH. What an exciting year this has been with all of the recognition by our customers, suppliers and the Central Florida community. 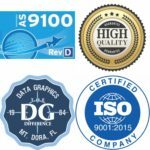 Data Graphics is once again among the rankings as a top Central Florida Manufacturer, climbing to number 6. Our core values continue to separate us from our competition. Data Graphics thrives on the building of relationships through trust, honesty and a quality product that arrives on time, and at a fair price. It all goes hand in hand; with DG you get it all–not to mention great communication and service from your sales team. If we are not performing, we want to hear about it. Many of our customers send us monthly scorecards to let us know how we are doing, with quality and on-time delivery being measured. Did you know we also score ourselves? Each week, our on-time delivery exceeds 96%, while over 60% of our orders ship before their deadline (if the customer allows early shipping). In addition, DG has a profit sharing program where our employees earn bonuses based on our limited returns and our internal scrap. 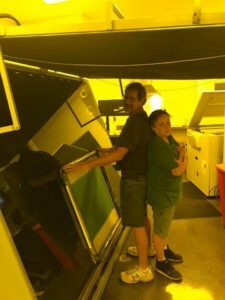 The attention we have paid over the last 32 years to quality, customer satisfaction, and on-time delivery (in addition to having the experienced, knowledgeable staff that can make the solve problems when they do arise) make us the best full-service custom printer in the world! (L-R) Kit, Becky, Shane, Liz, and John just before we hang the Rockwell Collins Platinum Premier Supplier banner. 6/10/16 – We wrap up our online celebration week celebrating the Rockwell Collins Platinum Supplier Status. 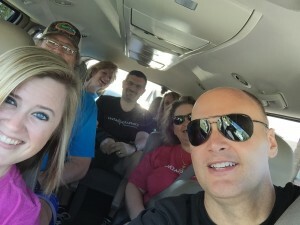 Thanks again to our incredible team and to our great friends at Rockwell Collins. The Art Department and Purchasing, (L-R) Pat, Weller, Rebekah, Karen, and Paul, enjoy winning the Boeing Gold Supplier Award. 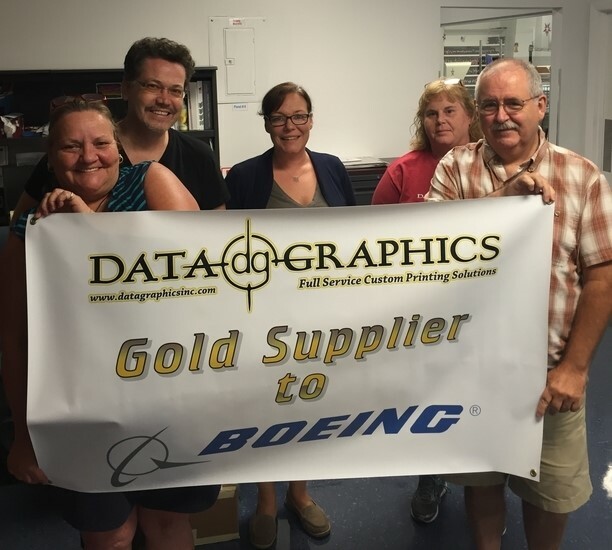 6/9/16 – Our Art Department and Purchasing Department are posing here with the banner commemorating our Gold Supplier Status with Boeing. To achieve Gold Status we sent nearly 19,000 individual UID’s, nameplates, overlays and labels without a single late shipment, or defective part…or, as the Art Department would point out, without a single mistake on the artwork. Thanks again to our great friends at Boeing and to the fantastic art and purchasing team. 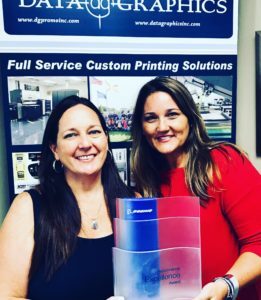 (L-R) Jen and Alisa do the bulk of our roll label printing, and helped earn the Rockwell Collins Platinum Premier Supplier award. 6/8/16 – We are at the mid-point of our online celebration week. 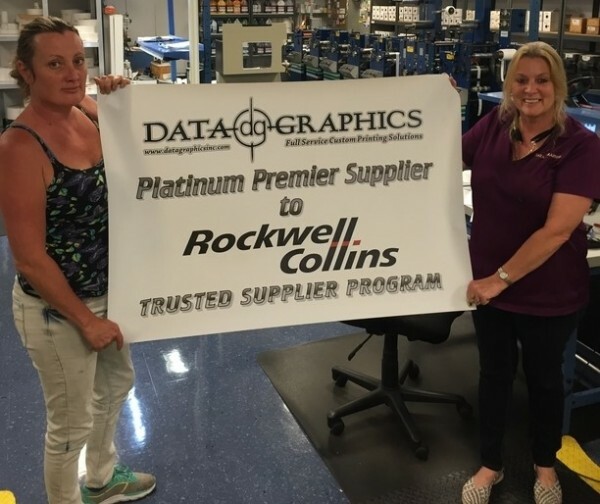 Jen and Alisa, who handle the bulk of the roll label printing, show off the banner commemorating our Rockwell Collins Platinum Premier Supplier recognition. Thanks to the roll label ladies, and Rockwell Collins for this honor. 6/7/16 – Celebration week continues here at Data Graphics. Here is the fabrication and digital team celebrating receiving Boeing’s Gold Supplier Award, the highest level rating they give their suppliers. This is an incredibly elite award. At any given time, typically 100-150 of Boeing’s 13,000 suppliers achieve Gold status. Thanks to Boeing, and our rocking fabrication and digital team. 6/6/16 – It’s celebration week here on the Data Graphics news page. We are THRILLED with some of the awards we have won in the last several weeks. 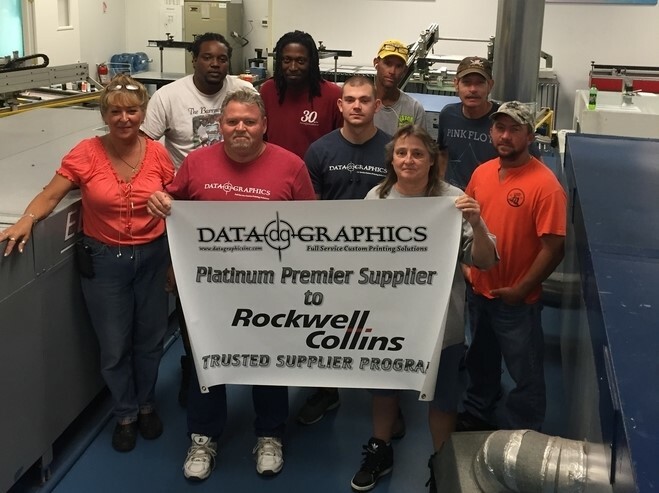 Here is the screen print team celebrating receiving the Rockwell Collins’ Platinum Supplier Award, the highest level rating they give their suppliers. OK, maybe not everyone here loves to get their pic taken, but we sure love the recognition. 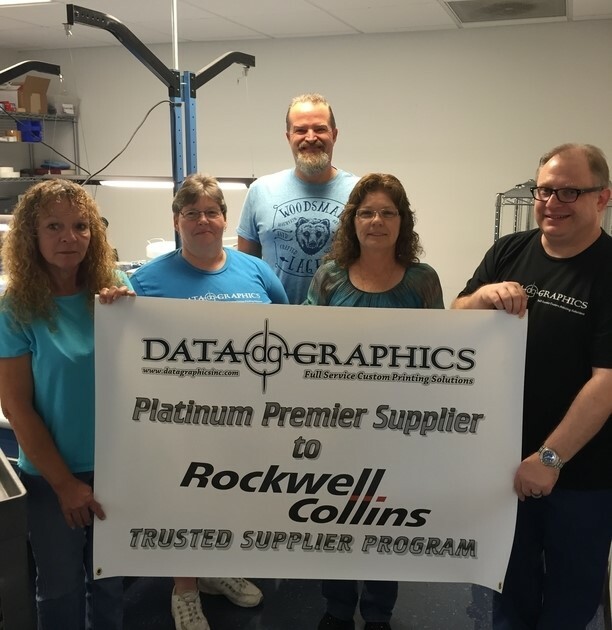 Thanks Rockwell Collins, and our awesome screen printing team. 6/3/16 – Yesterday Jennifer Sullivan, member of the Florida State House of Representatives for District 31 visited us. 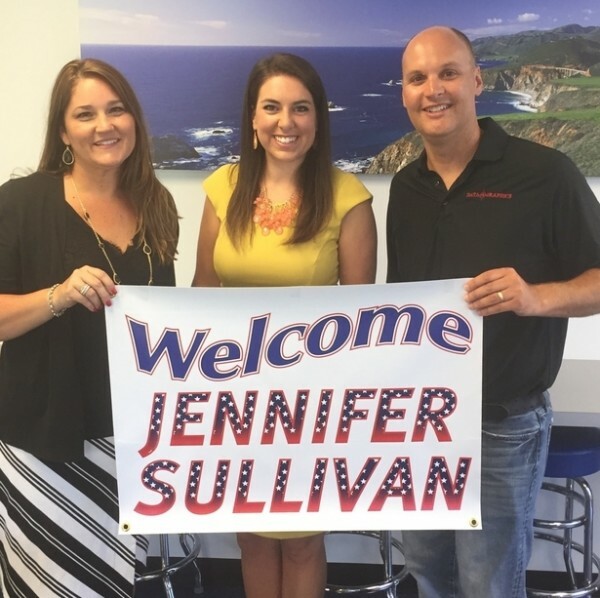 She toured the facility, met with our staff, sat in on a plant meeting, and spoke to us briefly about her goals and eagerness to help small businesses. Her take on Data Graphics? “Thank you for running such a first-class operation. 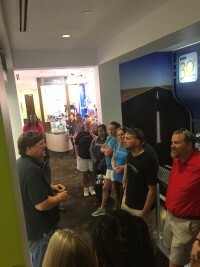 I greatly respect your commitment to excellence and the way in which you genuinely care for your employees and their quality of life …These are the stories I want to be able to share in Tallahassee.” Thanks for the visit, Representative Sullivan. We look forward to working with you in the future. We recently learned that last month Data Graphics met the prestigious (and challenging) Gold Standard for Boeing. What exactly does this assessment mean? Not a single one of the nearly 19,000 individual overlays, nameplates and labels that we sent Boeing in the last 12 months was late, or did not meet Boeing’s quality standards. For the last 6 months or more, we also received a rating of 4.8 or higher (out of 5) on the General Performance Assessment Summary. Thanks to everyone on both the Data Graphics team and the Boeing team who helped make this happen. Almost 19,000 parts in a row without a miss…for our next trick, we are going after DiMaggio’s hitting streak. Today, in honor of National Military Appreciation Month, we want to pay special tribute to Josh Gee. Josh has been a valued member of the Data Graphics Team for 3 years. He just returned from a 7 month tour of duty with the Air Force National Guard’s 125th fighter wing. Though the operations he participated in are largely classified, he can disclose that he was part of a security forces detail in SW Asia and did see some combat action. During his time there, he finished both his AA degree in criminal justice, and his Airman Leadership School training. With that certification, Josh can become a staff sergeant in the Air Force National Guard once he has met the required time in service. For Josh, the worst part of his tour was having to be away from friends and family for the holidays. He was also no fan of heat and humidity where he was stationed, and said it is even worse than Central Florida. Apparently, it was a cross between a sauna and an oven 24 hours a day, and there were plenty of long, hot days. In fact, one of the things Josh likes most about coming home is being able to work a predictable 8 hour day…in air conditioning. 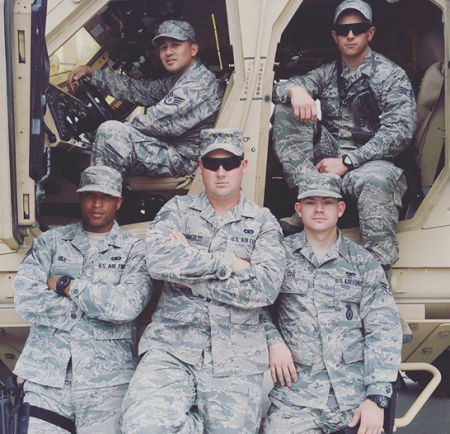 Josh Gee (front right) and members of the Air Force National Guard 125th fighter wing. Josh comes from a military family, as his grandfather, father, a cousin and uncles, have all served with distinction. In fact, it was his Uncle Vern, a long-time Data Graphics employee, who helped Josh land his job here shortly after he moved to Florida 3 years ago. 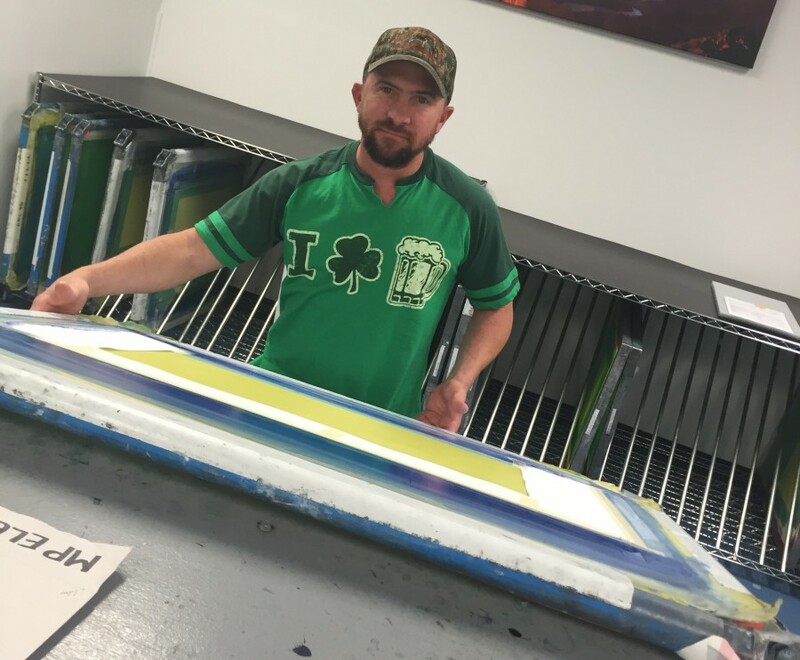 Josh runs one of the UV presses and is a dedicated employee. We are so happy to have him back. There is a good chance, however, that he will re-enlist for couple years when his initial commitment is up, and have another tour of duty in the future. Josh is 22, so he has several potential years of service left. He is a self-confessed “adrenaline junky” and is seriously considering para-rescue. Apparently, jumping out of planes into combat zones is the only thing that can match the rush of running a screen press. 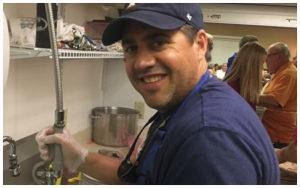 In his spare time he loves to fish, spend time with friends and family, and hunt deer, duck and hog. We are so grateful to have you back with the team, Josh. 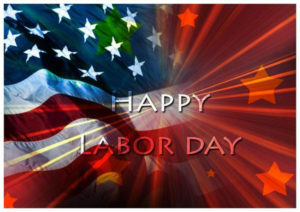 More importantly, we honor you for your bravery and service. Thanks for all you do, Josh. It was a bitter-sweet day at Data Graphics, today. 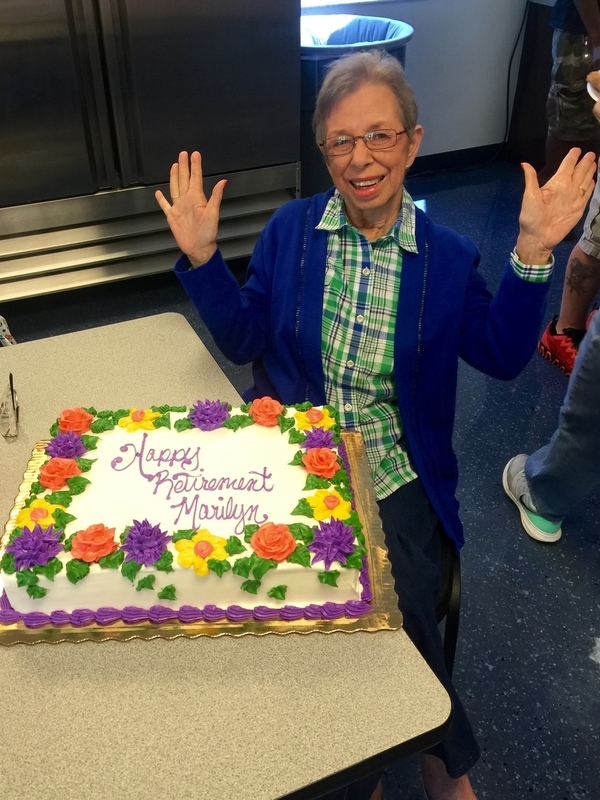 The sweet was not just the cake and the pizza, but the fact that we got to wish Marilyn Garner a happy retirement. Bitter, because after 21 years of service we hate to see her go. 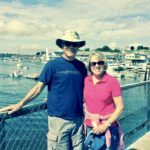 She was both an integral part of the accounting department and, universally regarded as a sweetheart. No riding off to the sunset, Marilyn. We expect to see you from time to time. Have a joyous retirement. After 21 years of dedicated service, you deserve it. 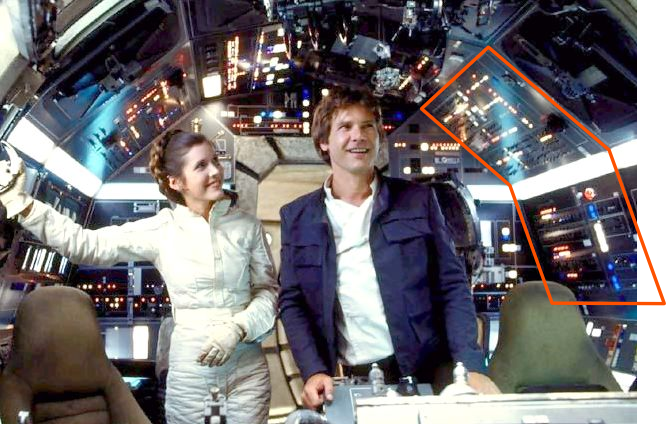 Little Known Fact: All those labels and nameplates on that instrument panel of the Millennium Falcon were manufactured by Data Graphics…a long time ago, in a galaxy far, far away. May the 4th Be With You! 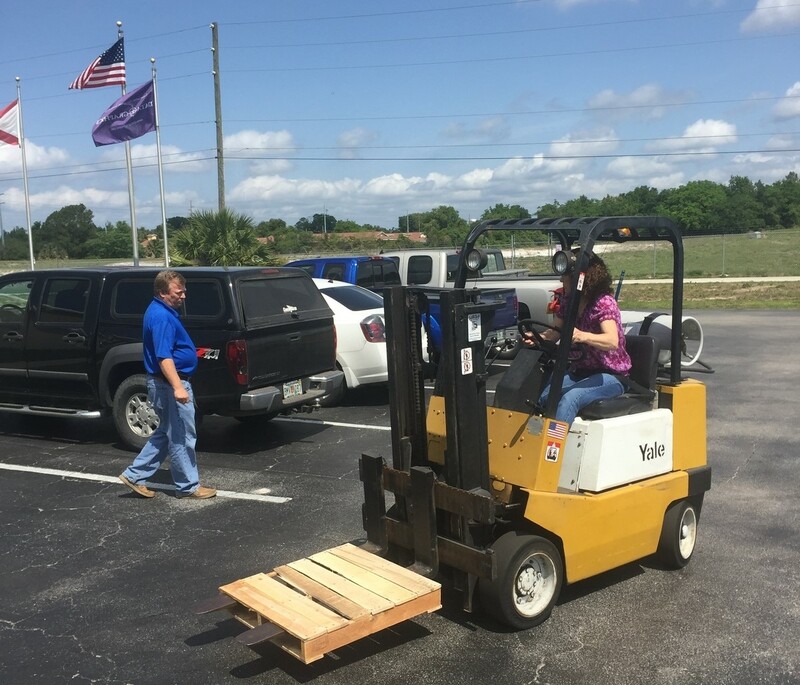 Congrats to Liz, Mike, Steve, and Earl for having their forklift certification renewed. 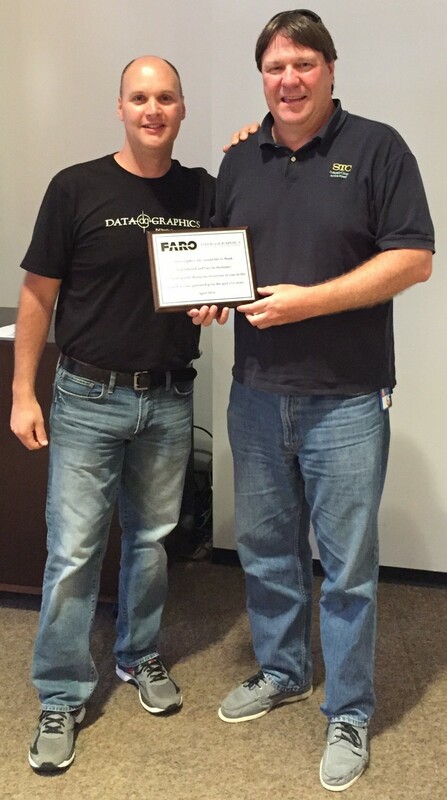 CEO Brad Presenting a plaque honoring our host with the most, Tom. Thanks again. 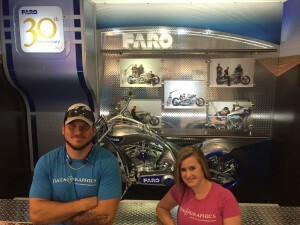 Special thanks to our good friends at Faro for letting us tour their impressive facility, hear their amazing story, and meet a few members of their team…and and pose next to the Faro bike. Faro, you are awesome! 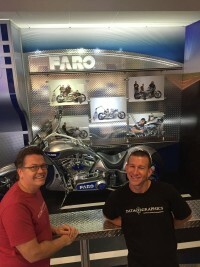 Our third installment of “famous encounters” hinges around the guys who helped build the Faro Bike you see in the pics above. 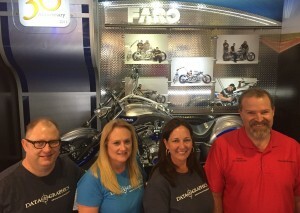 Yep, that incredible custom motorcycle was built by members of the Orange County Chopper Team. It turns out the Orange County Chopper boys were huge fans of our sales engineer, Shianne, and were eager to get her autograph and pics taken. 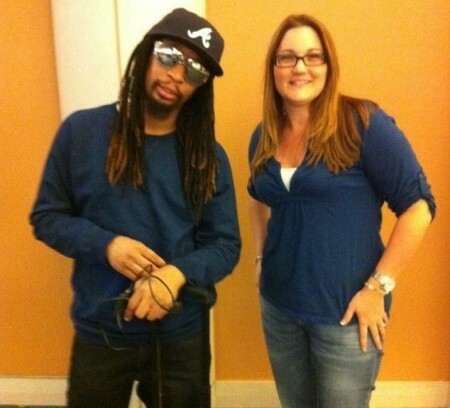 Our second in the series of “famous encounters.” Buffy and Jacquelyn bump into Recording Artist “Little John” at the Atlanta airport. Next to our road warriors, his nickname fits pretty well. 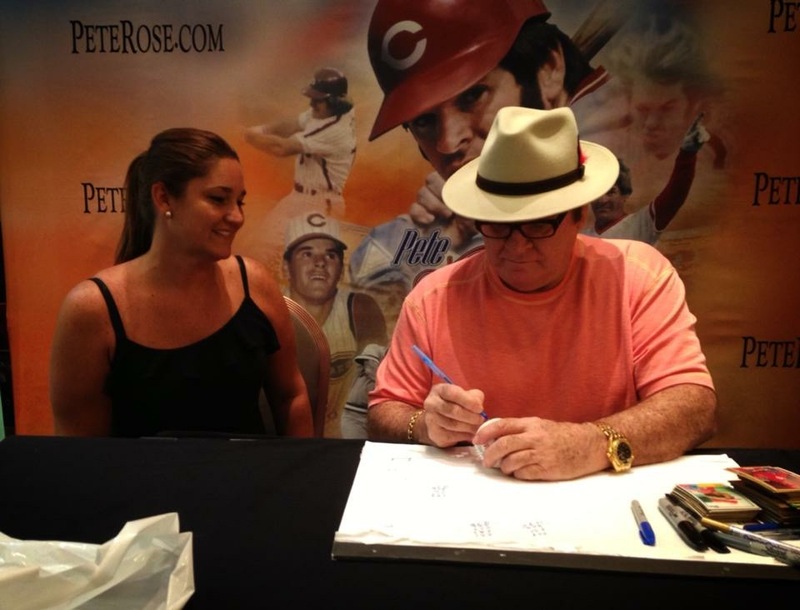 Since yesterday was opening day, it seems appropriate that we start with MLB legend Pete Rose. Buffy did have to pay for this autograph, as opposed to the usual random encounters at the airport, but since she was visiting a client in Las Vegas, why not? 3/22- Our thoughts and prayers are with the people of Belgium. Today we are especially thankful for the veterans and families of veterans on our staff and our clients’ staffs. 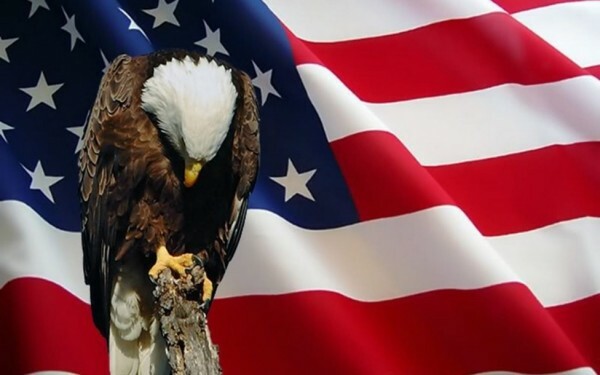 Thank a vet or a first responder for all they do. Where would we be without them? The ladies went all “Mission Impossible” on us. 3/17- Happy St. Patrick’s Day from Data Graphics, where today all of the labels are green.